When you present as a team your presentation skills will be tested. Really tested. That’s because your audience will focus on each one of the presentation team in turn. Individually and collectively. That’s a challenge for you, the team leader. And it’s an even bigger challenge for your team members. So these team presentation tips should come in handy. You should set roles for each member of your presentation team. Your most able or knowledgeable presenter can lead the presentation. Another team member can introduce the speakers, field questions and distribute them to team experts. Other speakers can focus on their respective areas of responsibility. A good tip is to rehearse your presentation together as a team. Therefore, practise all the roles and responsibilities. Practise the the introductions, links to new sections and question answers. 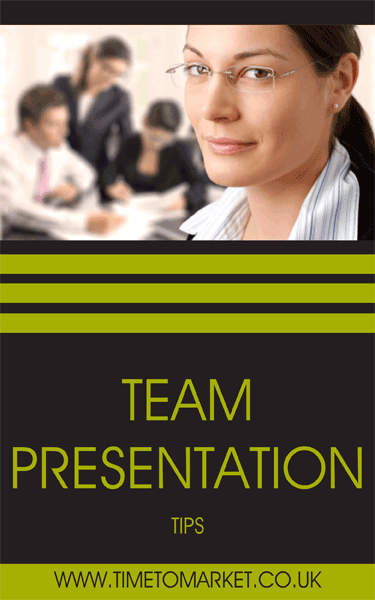 Your team should practise their presentations individually before a final dress rehearsal. So take every opportunity to edit your material. Thus, you limit the points made by each speaker. Plus, you stick to the agreed timescales. Just remember that you don’t want a team-based death by PowerPoint presentation. You can easily undermine a team presentation with inaccurate figures, data and facts. Therefore, a good tip is to verify all the presentation points made by the team. Second, check that they are current. Then check whether forecast or actual figures will be presented. And, lastly, remember to check the timescales being used in each section of the presentation. Perhaps an iPad app could also help with your team presentations? Your responsibility as a team presenter is to your team. You won’t do the team any favours when you interrupt them or correct fellow speakers. So you should only be tempted to correct a fellow speaker if they say something grossly inaccurate. That’s unlikely if you have verified and rehearsed your material. So, aim to present a positive and credible team capable of group work. When you do it well, a team presentation can be very powerful, so here are three tips to help. Agree all the team roles well in advance. Rehearse your presentation as a team, not individually. Take responsibility for your presentation as a team. Own it. So, team presentations can be taxing but productive. And yes, they take time and effort to put together. Time and effort to rehearse. And, of course, time and effort to get right. But when they are right your team presentation is a great opportunity to impress your audience. There’s a good example of a team presentation as the flight MH17 joint investigation team make a case for the prosecution. For more team presentation tips, you can always join a presentation training course. We hold regular courses at more than 40 training centres in the country, so you are never that far away. So, please don’t hesitate to contact us.